The foundation ‘Groningen Verwelkomt Vluchtelingen’ aims to welcome refugees in Groningen and to make them feel at home in the city of Groningen. We do this by organising and coordinating social and cultural activities. We also function as an intermediate between the society and the refugees. 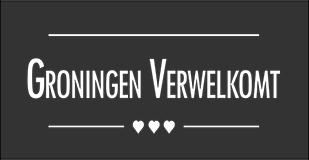 Like our Facebook page ‘Groningen Verwelkomt’ and receive updates about our activities. Are you a student? Than check out our Facebook page ‘Student Verwelkomt’ too. We are always open for new initiatives. Do you have a good idea you would like to set up? Let us know! We are also looking for people who can help to keep the foundation up and running. Would you like to help volunteers and refugees find each other, and are you available for a couple of hours a week during an extended period of time? Than sign up to become a volunteer for our foundation. We need materials for our different initiatives. Clothes, cooking utensils, office supplies, we need many different things. Sponsor us. The activities we organise cost about 50 euros per refugee per year. More money enables us to do more for the refugees. We are expecting to obtain our ANBI status soon, making donations tax deductible. There are different ways to contribute to our work. Via this mailaddress below you can inform us about your willingness to help. We will contact you as soon as possible.